Loyal SPATEX exhibitor and hot tub product specialist Golden Coast has paid tribute to two long-serving staff members ahead of final preparations for the 21st anniversary edition of the wet leisure showcase. At Barnstaple-based GoldenCoast, more than half the staff have now been at the company for more than a decade. The latest recipients of the long-service awards are graphic designer Amy Warren, and technical sales specialist Paul Waitimas. In her ten years at the company, Amy has played a pivotal role and utilised her graphic designer skills to create a wide range of promotional material including advertisements, brochures, pricelists and exhibition graphics. On top of this, Amy has also helped GoldenCoast customers promote their businesses through the creation of custom-branded materials. The popular retrofit brochure, for example, can be branded with company logo and contact details. 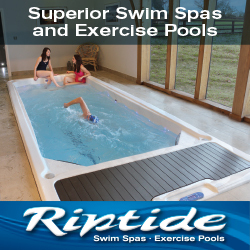 Developed to inspire existing pool owners looking to breathe new life into their pools, the sales tool introduces them to products that make pools easier, cheaper and much more pleasurable to run. Paul, meanwhile, has just passed his 20th year with GoldenCoast, which is among the staunch loyal supporters of SPATEX that is being hosted from Tuesday, January 31, to Thursday, February 2, in the Ericsson Exhibition Hall of the Ricoh Arena in Coventry. A specialist in sauna and steam, a sector which the company has promoted extensively at SPATEX and has reported is growing annually, Paul works tirelessly to support the many GoldenCoast customers taking Tylö’s domestic and commercial products to market. 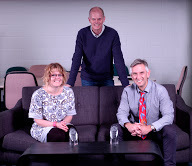 Golden Coast Managing Director Jamie Adams, pictured, centre, with Amy and Paul, has praised the duo for their long service contributions and the impact that they have made during their time with the company. “It’s always great to see members of our GoldenCoast family reach a milestone, and Amy and Paul really deserve recognition for their unwavering commitment to us, but – more than that – our customers,” said Jamie.